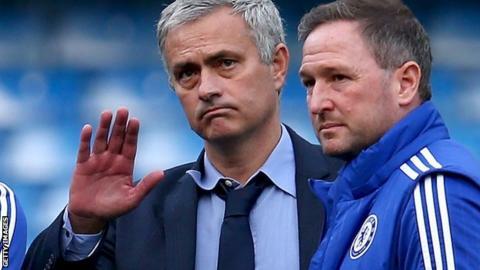 Chelsea goalkeeper Asmir Begovic says manager Jose Mourinho has the players' support and is the right man to revive their fortunes. The Blues lost 1-0 at Stoke City on Saturday, a third straight Premier League defeat and are 16th in the Premier League table. Mourinho, 52, missed the game as he served a one-match stadium ban. "We are behind the manager - you can see that from our performances," said ex-Stoke player Begovic. "We think he is the right man and someone we work hard for. His spirit and his presence is always there. We wanted to get a result for him." Reigning champions Chelsea are just three points above the relegation zone after losing seven of their 12 league games. Chelsea started last season brilliantly and had scored 30 goals after 12 league games. Twelve months on, they have struck the net a mere 16 times after the same number of matches. According to former England striker Alan Shearer, it is their failings in front of goal which are damaging them. "Stoke were brilliant but a massive problem for Chelsea is scoring goals," he said on Match of the Day. "There were not enough questions being asked of the Stoke back four and they were very, very comfortable. "There was not enough running from Chelsea - people were going towards the ball rather than in behind. It was far too easy for Stoke to defend. That all changed when Loic Remy came on but before that it was just too easy for Stoke to defend against." STAY: "Jose Mourinho should stay as Chelsea manager - he is one of the best in the world and who would they get who would seriously be a guaranteed improvement? No-one I can see. "They are still in the Champions League and, even though it was a loss, this was an excellent performance at Stoke and not a display of a team that has lost faith in its manager. The fans are also clearly right behind him as well, which is a crucial factor." STAY: "We are talking about one of the top two or three managers in the world with a proven track record of success. He is one of the best around and you do not simply sack people like that on the basis of their first bad run of results. "And, of course, once you sack someone you have to replace them and who out there is better than someone of the calibre of Jose Mourinho?" STAY: "If he didn't have the support of the fans I think he would be gone - but they are behind him, which makes a difference and they are still in the Champions League, which also makes a difference. "I do think the idea that they will bridge a 13-point gap to fourth place and reach the Champions League next season is rather fanciful. Once that realisation kicks in it is going to be tough. "So should he stay or should he go? I personally think he should stay but he must be very close to the edge." STAY: "You only get rid of a manager at this time of the season if it is clear the players are not performing for him and on the basis of what I have seen here at Stoke City the players are performing for him. "The players were clearly putting it in and Chelsea played well. He has also shown his ability over the course of a hugely successful career so he should stay." STAY: "I thought that was the best Chelsea performance I have seen for quite some time and it was certainly one to encourage Mourinho, if not the owner Roman Abramovich. "And as others have said, if you get rid of a top-class manager like Mourinho now who do you get in who would be better? He should stay." The last time Chelsea lost seven of their opening 12 games in a top-flight season they were relegated (1978-79). Charlie Fox: "Biggest issue is who do Chelsea get if they sack Jose when they really want Pep Guardiola next season if possible." Ashish: "Chelsea's November-December fixtures look really good. That should save Jose's job and revive Chelsea." Kofi Ackah: "What an excellent performance, Chelsea were by far the better team. Hard luck, in Jose we trust!" Henry Ice: "Jose should've concentrated on getting his team ready for the title challenge rather than picking fights with Arsene Wenger." JonCC: "Jose is a great manager, he is just going through a rough spell and it's getting to him, I'm sure he'll turn it around." Chelsea Warrior: "If we don't make the top four, it might do us some good. The team needs a rapid refresh. Just leave Jose alone. He will fix us." Nathan Sharp: "Who's the 'specialist in failure' now, Jose?" Dan Tinkler: "When was the last time Chelsea had played more matches than points won?! Surely never in the Abramovich reign!" Max Headroom: "Twelve games, seven defeats, only 16 goals scored and everyone still loves Jose? Where's the sense in that? Someone please explain."